Today I passed through Purgatorio, Inferno, and Paradiso in a matter of hours. I didn't sleep at all last night. I started at a yard / estate sale that was rather small, but I found a Fletcher Platt book I didn't know existed, a couple books to read, some SF ephemera I think I can flip, and a pair of copper bells. I think I will offer one to a flower I know, if she will accept. Then I spent the better part of an hour working with an obstinate photocopier at Kinkos, copying documents for the "discovery" phase of a lawsuit I'm party to. Documents I'd really rather not other people paw and sniff over. Yet there I was, making copies of them. Hurts to do, but it would hurt worse not to do. I picked to inflict the lesser pain so the harsher pain wouldn't be forced on me later. Ugh. I was in a bad way afterward, and I drove off to find a sanctuary. The particular bookstore I sought apparently no longer exists. I tried not to cry and drove to a thrift store I'd heard "had books" but I wasn't sure what that meant. What it meant was a basement full of used books, orgnized by subject and kinda-sorta by author's last name. Los of books. Five times more, at least, than I would have expected from a thrift store. I probaby spent n hour there, with the books. Just a few days ago, gave away about 50 books from my library, so I felt okay about inviting some new ones in. I found a paprback on bipolar tat I'd been wanting to read, and Barry Glassner's The Culture of Fear, each 50 cents. I found (much to my amusement) the econometrics textbook that my uncles by marriage wrote. I bought it, to bring it home. Then I found a copy of James Clavell's Tai-Pan, which I loved in high school but hadn't read since. I think it's a first edition. And THEN I found a book y Joseph Heller that I hadn't read, and that I'm 99% sure he autographed. I bought it for $1.50. Even if the4 signature's a very clever forgery, I still feel more than satisfied. So I sit, content and tired, cleaning and repairing the Pratt as best I can. I guess I have a job. Kind of. Freelance, I guess. I've an arrangement now with Book House such that anything of theirs that I sell, I get 1/3 (cash, not trade, like I get with the cataloging). And creating the spreadsheet I'll use to track them sure beats working more on the discovery stuff i have to do for a stupid lawsuit. I was doing that stuff for hours. Now it's time for nini stuff. Like...typing postcard data into Excel. Wow, I have an exciting life. In more exciting news, the pictures I took in Africa are almost sorted. I've winnowed them down from 3600 to about 400. After more filtering, I'll let people see them. I was NOT going to subject anyone to a 3600 image slide show. My own eyes have been crossing as I go through them, and I took the darn pictures. Yesmin asked today how many languages I want to learn. She didn't define "language" or explained "learn to what proficiency" so I said, "All." I didn't explain that I only want to be able to read these languages, nothing more. My language skills do leave much to be desired. I'm can read Latin, well enough that without a dictionary I can at least tell what the text is about. Chinese, eh, I can pick out characters I know, but that doesn't give any hint to the main content. I cansit down with a dictionary and work it out. Romance languages I need a dictionary for the parts I can't guess from English and Latin. I'm working on very very very basic Russian, focusing of how to look this up in a dictionary. Spanish is the only language I have a interest in learning to speak, because a new chuck of my family is from Spain and the DR. I can do very simple greetings in Chinese. I like to look at at Coptic, but I don't think I'll study it. Magistra Ward, ave et vale. Ms. Ward, you were one of the best teachers I've ever had. I wish I'd told you that when you could hear it. Thank you for everything you've taught me. I went to the Book House today. I only stayed an hour and a half. my husband starts school tomorrow, and he's been dreading it. I wanted to spend time with him before he went off with a few friends, help give him "one last happy night" before the drudgery of law school begins anew. I had enough time to confirm that "my" bookstore was all in order. I talked with the owners about my Africa trip, the corrupt inefficiency that is Zimbabwe, the beautiful potential of Botswana, and the unstable suspension of South Africa. And I wandered the shelves. 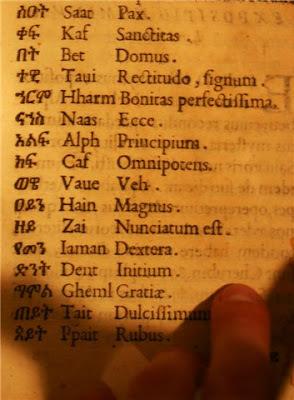 My latest prize: an introduction to the basics of Ge'ez (Ethiopian) written in Latin, printed in 1630. It's called Chaldeae sev Aethiopicae Lingvae Institutiones, published in Rome. The covers are marbled, and the paper feel like linen. From what I've been able to read of the Latin (based on too many years of Latin in school plus too many years in choirs and a brief obsession with the Latin Mass that made me mourn pieces of Vatican II) and from the state of the book itself, it's a block printed guide to the language of Ethiopia for Catholic missionaries to the Coptic Christian churches there. I don't know when Christianity officially split in Africa, and I don't know how close Coptic Christianity is to Roman Catholicism, either then or now. The book is slender and small, very easy to carry. The pages are a bit water-stained. I like to imagine that, given the date, the expense of printing, the type of wear, and the missionary zeal of Rome, that this book was actually taken to Ethiopia, that it wasn't made just to stay in a monk's cell. I imagine it travelled with some missionary, from Europe to Africa, in the 17th century. I'm now sorting through 3,600+ digital images. I think I satisfied both requirements. The first two started interesting conversations at the in-law's reunion. So did the psych journal I brought, the latest Psychology, Public Policy, and Law with its study of mock jurors and the power of DNA evidence (to my horror, most subjects seemed to think blood type was the same as DNA, and if a suspect's blood type matched that found at the scene, it was as damning as matching DNA. American science illiteracy seems to be as high as math illiteracy). Those two books turned out to be much discussed, and I was very pleased. I always learn things at the farm. One uncle and I discussed how the taxation results in money "lost" from the market - money that doesn't go to government, supplier, or purchaser, but somehow bleeds off the system (not even taking into account fraud or the money/effort needed to collect taxes). He got a bit turned around, and my old minor in Econ finally came in handy in drawing accurate supply and demand curves. I'm so cool. I had too much time in the airport coming home. I know that because I doubled the books I was carrying. I got a book on traffic (recommended by both Wired abd The Week, so give it time - it will be a NYT bestseller, and for once I'll be leading the trend), David Bellavia's House to House, a few Harvard Business Review books, and a long list of books to get elsewhere so I didn't have to carry them on the airplane. I also bought a diet Coke. I like being in the US. It's a diet Coke here, not a Coke Light, as in Canada or the African countries I've been to. Yes, these little things are important. Today I've set aside time to read a bit from the books I bought as souvinirs in Botswana, Zimbabwe, and South Africa. Happiness. I have 24 hours at home between family vacations. Just enough time to switch out books (and try to wash ten days of African dust from a couple T-shirts and khakis). I went to England for a friend's wedding. I played piano and sang for the processional and recessional then left before the reception (I'm so sorry, Pam!) for the airport. I spent almost two weeks with my family (husband plus parents, brother, and brother's fiance) in South Africa, Zimbabwe, and Botswana. We flew on tiny planes within Africa (one only had 5 passanger seats, so one of us sat in the vacant copilot's seat). This meant a weight restriction on luggage. This meant a restriction on the number of books I could bring. Especially since I like to buy books from countries I visit as souvinirs, so I needed a few pounds of leeway. So I brought books that either read slowly or had tiny print. Hannah Arendt's On Violence read slowly. So did Konrad Lorenz's King Solomon's Ring. Richard Dawkin's The Selfish Gene went slow enough - I could have read it much faster had I not been mentally parsing every reference to Lorenz's On Aggression, trying to isolate what the man who coined the term "meme" actually meant by it (ignoring how it's often oversimplified or misunderstood, and also how the concept has developed in the past 20 years). On the 18 hour journey home, I read Leon Uris's Mila 18 cover to cover (not the best book to read while traversing multiple security checkpoints). Sadly, it ended just as I expected it to. (I gave my husband periodic updates every 100 pages. Then every 20 pages as I neared the end. "Not everyone's dead yet!"). I have no weight restrictions on my next trip.